Home › Environmental News › Hey Sandy, Have You Picked Your Target Yet? Hey Sandy, Have You Picked Your Target Yet? It’s beginning to look like neglecting to mention climate change on the campaign trail is no safeguard against mother nature having a say in how these elections turn out. With only 10 days left before the 2012 presidential election, severe weather patterns again threaten to disrupt the carefully laid plans of the Obama and Romney campaigns for the second time in a little over two months. The mere threat of Hurricane Issac caused the GOP to scrap the first day of their National Convention in Tampa back in August and, if meteorologists are to be believed, the storm that’s hurtling towards the east coast at this very moment will do a good sight more than threaten us. Weather reporters have had to bust open their Roget’s Thesauruses to try and avoid repeating themselves in the prognostications of the doom and gloom that they expect will be wrought by Hurricane Sandy when she makes landfall on Monday. 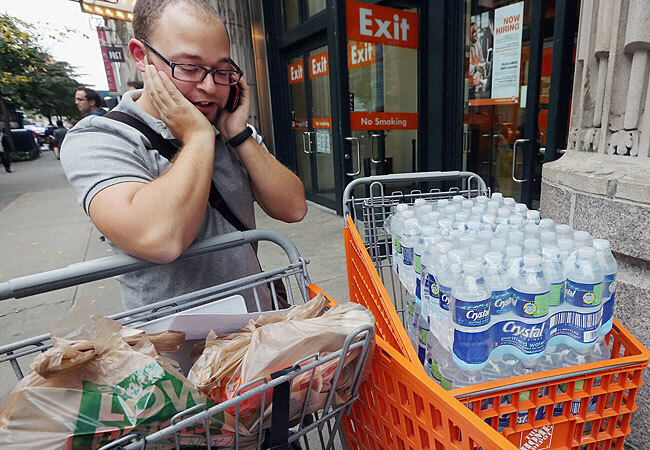 Sandy is being touted as an unprecedented “Frankenstorm” that has the potential to cause billions of dollars in damage and leave the east coast of the US flooded and without power for weeks. All of this comes a year after Hurricane Irene descended upon the eastern seaboard, wreaking enough havoc to clock in as the 5th costliest hurricane in American history. And, while the genesis and meteorological makeup of Irene and Sandy differ, their formation in successive years begs the question, is this the new normal? I am not a climate scientist or even someone with a sophisticated grasp of weather patterns and meteorological phenomena. Odds are that I personally have a similar weather IQ as anyone who might be reading this article and I want to stress that I am in no way, shape or form anything approaching an authority on climate change. However, the meteorological events of the past decade have crossed that invisible line in the sand where phenomena stop being the purview of the scientific community and start being common sense. As I have mentioned in previous articles, the past eight years have seen an unprecedented concentration of severe natural disasters in all parts of the world and in myriad forms. Between the tsunamis in Japan and the Indian Ocean, the cyclone in Burma, Hurricanes Katrina and Irene, and the earthquakes in Haiti, Kashmir and Sichuan, we have seen over 700,000 deaths and untold billions in property damage since 2004. When you couple that with the record heat waves we’ve seen in recent years and the sudden predilection of our polar ice caps to liquify at a moment’s notice, it’s hard not to acknowledge that something bizarre is happening to our planet. It would’ve been nice to have our two presidential candidates assuage our fears over the past few months by having a nuanced and substantive debate about their plans to systemically change the manner in which we as a nation consume energy into ways that are ecologically responsible. So, naturally, President Obama and Governor Romney devoted the bulk of their discourse on energy to flagellating themselves at the feet of the US coal industry in an effort to eke out a few thousand votes here and there in the hills of Pennsylvania and Eastern Ohio. Couple this with their insistence on fracking our way out of the energy crisis and you’re left with an energy policy that appears to be actively trying to destroy our environment at as fast a rate as possible. I’m surprised Mitt Romney hasn’t taken to ending his rallies by spraying CFC-laiden aerosol cans into the air while setting fire to giant piles of styrofoam. Experts are now saying that Hurricane Sandy is the largest storm in the recorded history of the Atlantic Basin and most of the East Coast has gone into a measured panic. States of emergency have been declared from South Carolina all the way up through New York and hundreds of thousands of vulnerable populations in low-lying and coastal areas are being evacuated. Schools are being cancelled, flights are being grounded and Amtrak has put up shop for the foreseeable future. The President has cancelled his campaign events for Monday and Tuesday and will be staying in Washington to monitor the storm’s progress and keep in contact with FEMA to try and avert any repeats of what happened in New Orleans in 2005.